The SEBO AIRBELT D lineup consists of 3 different canister vacuum cleaners that are very similar, with only slightly different configurations. All 3 are full sized commercial grade models that are designed for whole household cleaning no matter what type of flooring you have. The choice you make will be based on if you have mostly carpets or if you have hard floors like tile, linoleum, laminate, and hardwood. But before getting into the differences lets highlight the main features that are common on each one. SEBO vacuums are consistently rated among the best for pet owners which is largely due to their excellent filtration and attachments. The D series are equipped with fully sealed hospital grade filters that will trap more than 99% of all allergens including pet dander, dust mites, and pollen. Anyone who suffers from indoor allergies knows how important it is to cut down on dust, and this is really the only way to have a healthy indoor environment. You must have a quality HEPA filtration system on your vacuum and use it on a regular basis. Homeowners with multiple pets are advised to clean their floors and other surfaces multiple times per week. The AIRBELT D canisters give you the tools you need to do this. The D1 is mostly for smooth floors as it comes with straight suction and no electric powered head. It includes their Kombi nozzle which has retractable soft bristles for hard surfaces and rugs, but won’t work as well on regular carpeting. For carpets you would want the D4 or D4 Premium which both come with a different version of their ET power head. The biggest difference is the size of the head as the white or black D4 Premium comes with the 12 inch ET-1 version and the red D4 has the option of a 12 or 15 inch (ET-2). The larger would be ideal for a more open floorplan with carpeting throughout, especially thicker or high piled. Either ET attachment does a great job at removing embedded dust or pet hair from down in the fibers. For that you need to have a spinning brush roll with powerful suction, and the D4 delivers on both. 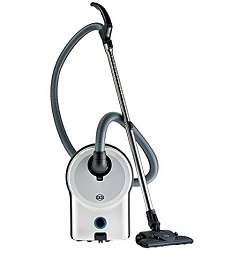 SEBO vacuum cleaners are also built with high quality plastic, aluminum, and steel parts which is far different from the cheaper brands made mostly of thinner plastic. That is the main reason you get a full 5 or 7 year warranty for any new machine you buy from them. 5 years is longer than many of the cheap or ‘throwaway’ vacuums that you find in the big stores even last. When you buy a SEBO you are really investing in a machine that will last for decades, providing you with a cleaner home and healthier indoor environment. The SEBO AIRBELT D series really is a complete cleaning machine, built to handle a large home with all types of floors. It has tremendous power, fully sealed HEPA filters that are endorsed by the British Allergy Foundation, and a huge selection of accessories for just about anything that would need to be cleaned. They are on the higher side of pricing when compared to most brands but that is because they are built to last. You won’t be replacing your SEBO every few years but instead will only occasionally be purchasing filter bags. For more information including prices and shipping specials, click here to visit our favorite eCommerce vacuum store.